Harley Tune-up, Oil Change and General Service at OSC Motorcycle Service Center. It’s always a pleasure to work on a bike that is well taken care of and looks great parked or going down the road. The owner of this bike has been coming to our shop for many years most often for a checkup and service. This bike was in a fairly serious head on accident and required a great deal of motorcycle repair to become road worthy again. Fortunately, the bike wasn’t totaled and the owner was able walk away from the motorcycle accident. The owner’s motorcycle insurance agent has been sending us big jobs like this for many years so the owner was very optimistic about what OSC Service and Collision Center could do for him. We got the call and sent our truck out right away to pick up the Harley from the scene of the accident. It looked terrible with bent forks, damaged tank, fenders and pipes. We could also see that the frame was bent. This was going to be a big job. For Total Motorcycle Collision Restoration the bike was first dismantled, then the frame was straightened and painted. 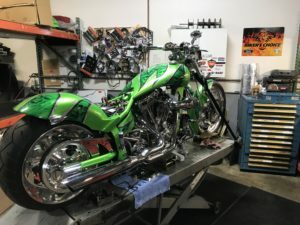 The front forks, fenders, exhaust pipes and tank needed to be replaced and then painted to match the original colors, all of which was completed on-site. After a few other motorcycle parts were replaced, this Harley was back on the road in about 35 days. The owner was amazed at how perfect everything was, and that it looked like it had never been in a motorcycle collision. We love this kind of work, because we have the opportunity to manage the total restoration of a bike from start to finish, turn it around quickly, deliver it to the owner’s door-step and watch them smile, ear to ear.